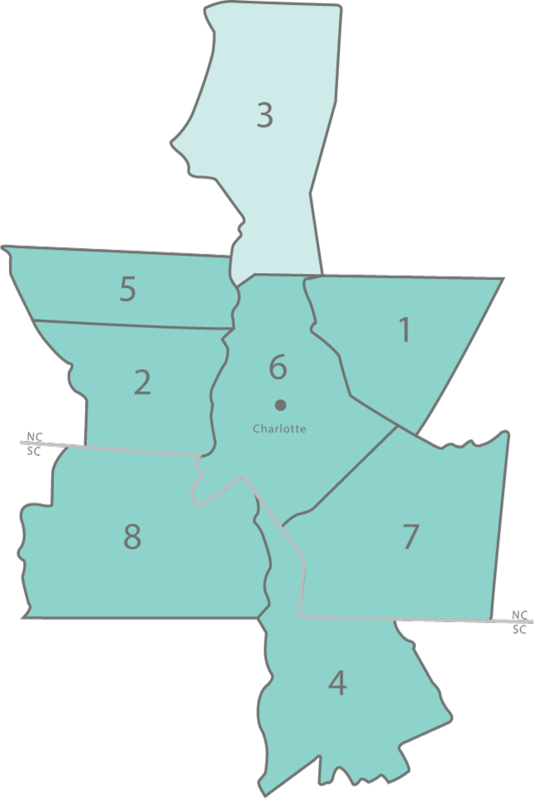 Iredell County is located north of Charlotte and is situated within the Piedmont Region of central North Carolina. It is one of the longest counties in the state and spans nearly 50 miles from its southern to northern borders and is divided into 17 townships. The overall population is 159,437, and the largest town is Mooresville with over 32,000 residents. The second largest town, Statesville, is the county seat, and has over 24,000 residents and a quaint historic downtown area. Iredell County is also located in a key transportation area of the state with I-77 and I-40 which crosses through the center of the county in Statesville. Iredell County dates back to 1788, and a large portion of the northern third of the county is dotted with small towns and remains mostly rural with many dairy farms. While farming has been a major industry for centuries in northern and southern parts of the county, the southern portion of the county has been growing rapidly over the past 15 years and part of that reason is the proximity to Charlotte and popularity of Lake Norman, which is North Carolina's largest man-made lake with shorelines extending into Iredell, Lincoln, Catawba and Mecklenburg counties. Iredell County is home to Lowe's corporate headquarters and Ingersoll Rand's North American headquarters. It is a major hub for NASCAR racing including many race shops mostly in Mooresville, which is proudly known as "Race City USA". It is also headquarters to the NASCAR Technical Institute which offers racing related instruction to prepare students careers in the racing industry. Mooresville also features The Pit Indoor Kart Racing, a 14,000 sq. foot facility and popular destination for race fans. Many NASCAR drivers live in the Lake Norman and Mooresville areas. Some of the smaller towns include Love Valley, nestled in the Brushy Mountains, which resembles an old western town and is well-known for its 800 acres of horse riding trails, variety of shops, and a variety of camping resorts. Harmony is located in the northeast corner of the county and is a small historic town. Troutman has over 2,300 residents and is located 30 miles north of Charlotte and is just outside of Statesville. It is also home to Lake Norman State Park. Statesville is host to two annual festivals: the National (Hot Air) BalloonFest which draws thousands from all over the country and the Statesville Pumpkin Festival. Residents throughout Iredell County enjoy the small town feel with nearby access to big city amenities.